Truck Running Boards: Shoe In, or Boot? Readership feedback to the question of running boards was off the charts. Literally 164 readers chimed in – and how! Who would have thought that running boards would spark such a passionate response? As you’re about to see, the majority of TCM readers have running boards on their truck camping truck, and love them. It seems that many of us have married height challenged wives who aren’t about to pole vault, trampoline, or otherwise climb into our trucks. 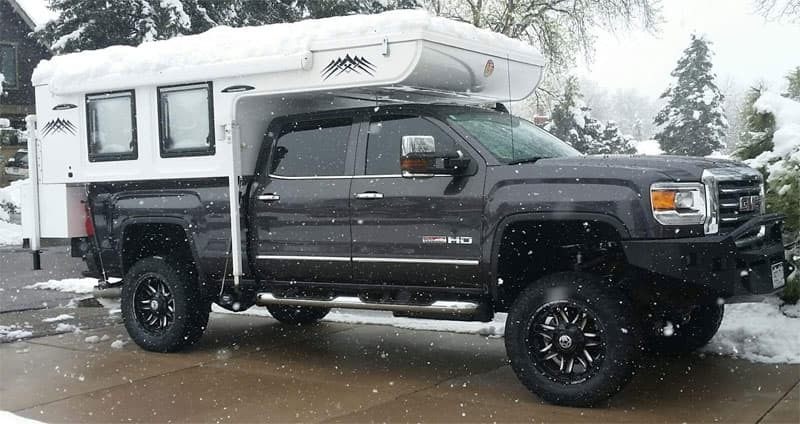 No running boards, no truck camping accomplice. Another often cited reason is the protection running boards provide from rock chips and other road debris. That’s a compelling reason for running boards that I’ll be thinking about. We’ve already added mud flaps for this exact reason. I also found the comments about seat deterioration due to sliding out rather then stepping down quite persuasive. Ten years ago we bought an eight year old 1998 Ram 3500 without running boards and the front seats were definitely worn on the outside edges. It seems the running board to seat wear connection is no myth. On the other hand, a good number of readers don’t like how running boards get dirty and/or full of snow. Another running board issue readers lament is how they subtract precious ground clearance for off-road travel. Cost and weight are brought up, but mostly the dirt gathering and ground clearance are mentioned. So will we get running boards now? Probably, but I like to think, study, research, and otherwise mull around endlessly about these things first. Just ask Angela! Home » Question Of The Week » Truck Running Boards: Shoe In, or Boot?